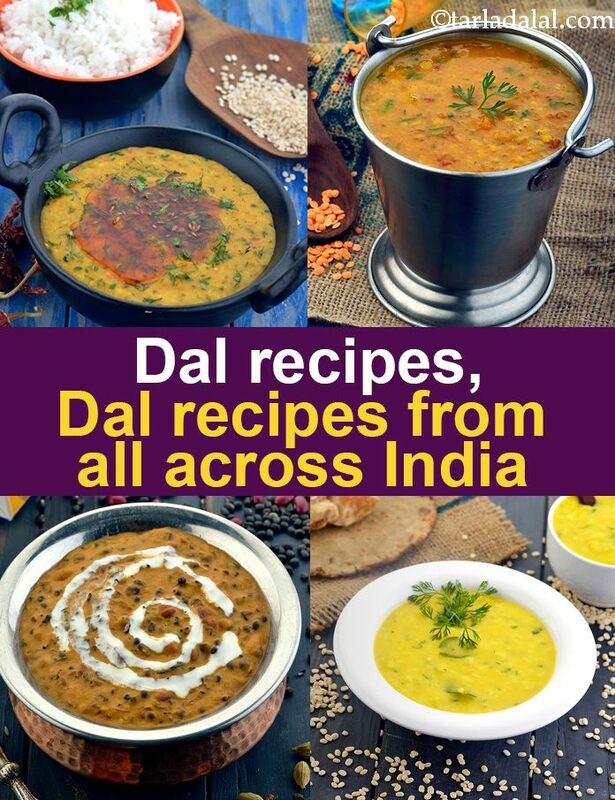 Dal Recipes, Popular Dal Recipes from all over India. Most households routinely prepare dal as part of their everyday meal. Different states have different homely ways of cooking dal, but one commonality is that most of these are quick and easy to prepare so they can be prepared without much ado on a routine basis. By getting to know about all these options, you are at an advantage because you can increase the variety of dals that you serve at home, making sure that your family is never bored of this essential category! Here is a collection of dals from Gujarati Dals, Mahrastrian Dals, Hyderabadi Dals, South Indian Dals, Rajasthani Dals, Moghlai Dals to Bengali Dals. Enjoy our collection of Gujarati dal recipes. From quick one-dish meals like Dal Dhokli to elaborate preparations, Gujjus cook them all. Come lunchtime and Gujaratis do not like to settle for anything less than a complete meal, which they fondly call the “Dal Bhaat Rotli Shaak”. Try your hands on this famous Gujarati Khatti Meethi Dal made by tempering toovar dal with mooli. The addition of jaggery and tamarind pulp provides the dal with its noteworthy flavors. The Gujarati Toovar Dal recipe is a homely dish that will remind you of mom any time, any where! A tempering of whole spices adds a lot of punch to this dal recipe, while tomatoes add enough tang and jaggery imparts a pleasant sweetness to it. For urad dal lovers, try our Gujarati style urad dal recipe. Maharashtrian Dal recipes. Popular Maharashtrian Dal recipes. Ambti/Amti is a Maharashtrian style dal, the literal meaning of amti is tangy dal but it is a balance of sweet and spicy flavor. Katachi Amti is a tongue-tickling preparation of chana dal which is an all-time favourite combination with Puran Poli. Also try the Maharashtrian amti recipe called Birda or Vaal ki Usal recipe. In Mahrashtrian villages it's called by the name Birda. Varan refers to traditional Maharashtrian lentil-based dishes. Here, cooked toovar dal is perked up with fenugreek leaves and tasty spice powders and pastes. An aromatic tempering adds to the traditional charm of the Methiche Varan, making sure that its aroma and flavour remind you of mom’s cooking! popular punjabi dal recipes. Nothing can be more satiating than a bowl full of Rajma curry and rice. This curry is a favourite in Punjab and very popular amongst all age groups. Another popular dal is Maa ki dal or Dal Makhani. Traditionally it is cooked on a low flame overnight and allowed to thicken. But nowadays it is made using a pressure cooker. Dal Tadka is the most basic Punjabi dal preparation made using masoor and yellow moong dal. You can even use any other lentil to prepare this dal, the flavor depends upon the tempering. The rich and creamy dal tempered with ghee tastes amazing with roti and rice. You can even enhance the dal by addition of vegetables. This Hariyali Dal made using spinach and chana dal is an excellent source of protein, iron, vitamin A and calcium. Rajashthani dal recipes. Due to the shortage of fresh vegetables and limited options, Rajasthani people often depend upon dals for all the proteins and other nutrients. They generally combine together 2-3 dals or some dal and vegetables and transform into a delicious, nourishing version. Cook up this Mooli moong dal or Palak toovar dal with a tempering of ghee and authentic Rajasthani flavour. Also, you can simply skip the vegetables and combine the dal with an assortment of spices and create finger-licking Dal Banjari , Panchmel Dal or Tangy Green Moong Dal. South Indian Sambar (Dal) recipes. Any South Indian meal, be it breakfast, lunch or dinner, would be considered incomplete without Sambhar. Toovar dal and an assortment of vegetables surely makes the sambar nutritious but, if you wish to bumper the iron content, then add fenugreek leaves to make Methi Leaves Sambhar. Bengali Dal recipes. A dal recipe from the kitchens of Bengal, the Bhaja Moong Dal Shobji Diye brings together moong dal with a horde of colourful, tasty and nutritious veggies! A simple dal from Bengali kitchens, Dal Kalai is made by flavouring cooked urad dal with a paste of saunf and ginger. Mughlai dal recipes. Dal Moghlai recipe may have originated from the royal kitchens, but this one’s a delight to make in the kitchen as well as relish. Toovar and chana dals are pressure cooked with lauki, tomatoes and turmeric and mixed well, before a tadka of garlic, ginger and jeera is added to it. Enjoy our Dal Recipes, Popular Dal Recipes from all over India and other dal, kadhi recipe articles below. This dal recipe made using chilkewali urad dal is a little bitter as the name suggests, but the bitterness is mild and only enhances the flavour of this dish. Extremely healthy, as the skin of urad is nutritious and fibre-rich.